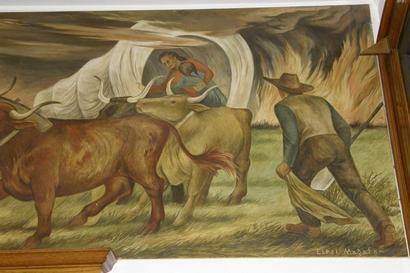 Blazing Canvases - Prairie Fires in Depression Era Murals. 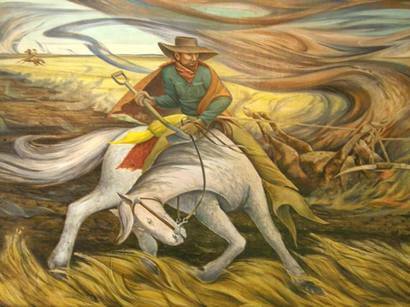 “The Run, April 22, 1889, Taking the Lead"
Second only to Indian attack, prairie fires were the most terrifying threat to pioneers. The threat continues today with recent fires in Oklahoma, Texas and Colorado. 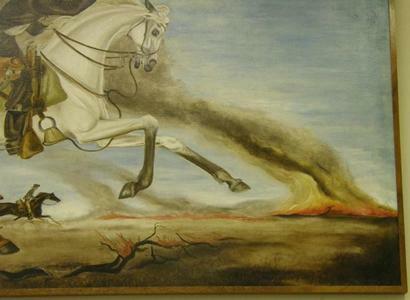 Kansas seems to have diminished the threat by fighting (future) fire with (intentionally set) fire. 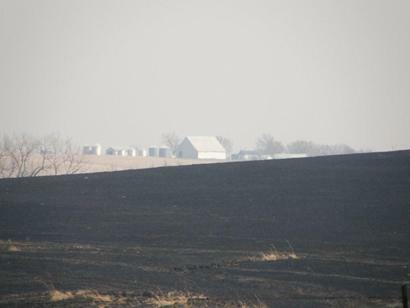 Dead grass is burned after winter throughout Kansas, eliminating potential fuel and creating fertilizing ash. A fast-burning fire twelve inches tall can easily be controlled while drought-dry 30 inch grass can ignite outbuildings, cars and homes. 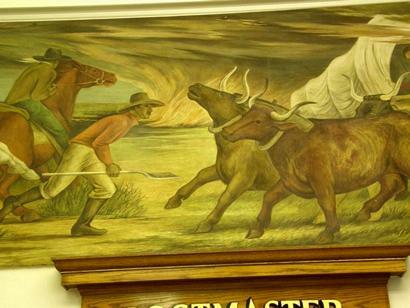 A detail from the Brownfield mural was used for the cover of the book The Texas Post Office Murals. Image left shows the detail as it appears in place, while the right side shows a reverse image for the cover.